Long before Fort Dearborn was established near the confluence of the Chicago River and Lake Michigan, Native American communities used the local river systems as means of transportation along with the extensive trail networks that later evolved into many of the roadways that are familiar names today. The Chicago neighborhood of Portage Park that commemorates the role of those trails and their relationship with the river system. Today, Irving Park Road is a busy thoroughfare that not only connects several unique neighborhoods, but also connects residents to river based recreation opportunities on both the North Branch of the Chicago River and the Des Plaines River. The Northwest Portage Walking Museum will weave an interpretive connection between the Chicago and Des Plaines Rivers that celebrates the natural and cultural living histories of local communities and Native-American contributions through art, education and recreation. The earthwork will be the first noted installation of an hybrid earthwork mound by an Indigenous Artist in North America, since the founding of the United States. 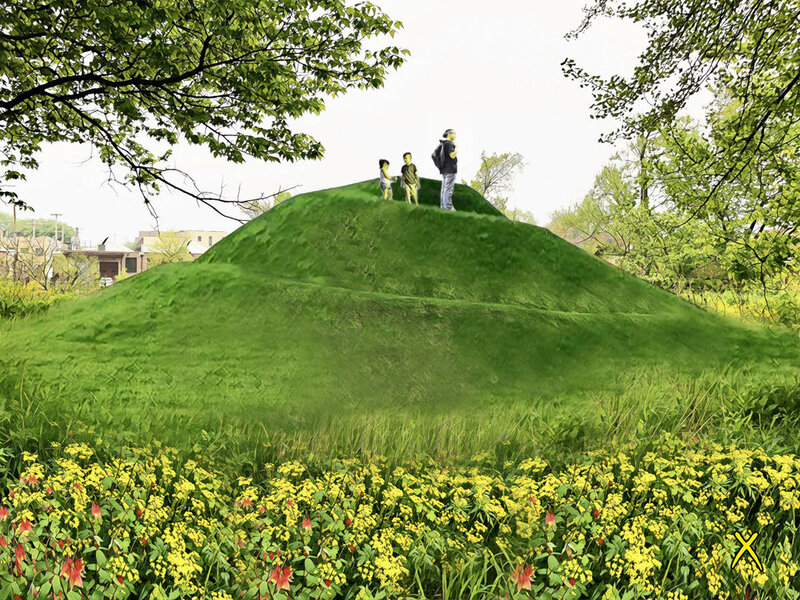 This significant homage to the ancestral practice of mound building serves to educate the public about the rich cultural history of placemaking, intending to activate the human connection to the river and its importance to the narrative of Chicago’s cultivation as a city. Through the installation and promotion of natural materials, Indigenous plant species, and the progressive preservation of local ecosystems, we seek to frame the sustainable practice of placemaking to create an experiential work of art that ponders the balance of our impactful existence with the earth and elevates our perspective looking towards the future of a sustainable urbanity. The serpent earthwork has great historical precedence in the regional narrative of ancestral earthwork art, but also locally as there is remaining evidence of a serpent mound in Thatcher Woods. This symbology prevails in highlighting the human connection with the natural environment and our connection to the universe. In Indigenous lifeways through symbology and storytelling, the serpent is a lifeform that is both revered and threatening, taking shape to warn humanity of the continuum of existence and our role to maintain the balance of our world. Earthwork mounds to date have been primarily erected for aerial legibility. This reclamation of the earthen typology in 2018 is designed to have a perspectival experience for our line of sight. This strategy is to promote our individual connection to the earth and to help us experience first hand the power of the land in efforts to implicate our acceleration of synthetic environments and the effects it has on our shrinking natural environment. The design harnesses the implied motion of the great serpent to create the illusion of a threshold being stitched together by this life form that can weave in and out of our world, land and water, reality and hyperbole. This movement surrounds the viewer to articulate a world that is bigger than our existence, pushing us to take control of the systems we do have power over in order to ensure our future on this world. The intentions of the materiality are to emphasize the natural materials and Indigenous ecosystem of the site while providing an effective installation that contributes to the narrative of place, from past to future. The project would benefit greatly from the re-use of local materials on site.